I think we are all aware by now that the month of May is Mental Health Awareness Month! what works best for me in managing my everyday anxiety. Let’s be honest here that sometimes it gets out of control, right?! Life can be overwhelming with all of the demands that come at us on a daily. Sometimes the little things we deal with in life get blown up to be made a big deal because there are so many little things taking over that it literally begins to deplete you mentally! Ugh those days are draining my friend, I feel you. 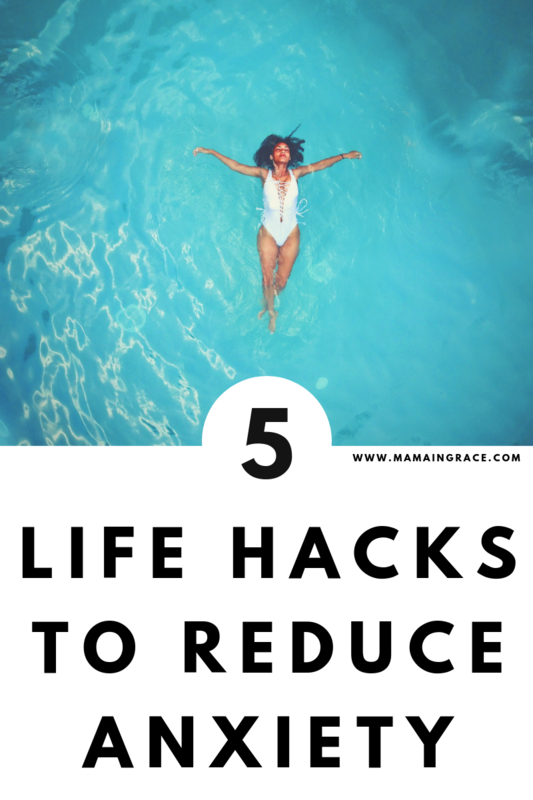 Sometimes it seems impossible and you don’t know where to start in getting it under control, here I give you 5 easy things you can start doing today that can tremendously help in reducing those anxious feelings (when honestly your just trying to relax at home). Go through that dreadful pile of paperwork taking over your counter. I am totally preaching to the choir here because I HATE going through paperwork and it seems to build up so quickly with mail, work stuff, and kids being in school and all that Jazz. I get it, it’s time consuming. Make a place for all of your important paperwork, first of all. Then, begin throwing away all of the outdated flyers, deadlines, and I begin to open all mail that’s been unopened and throw away all of the envelopes and extra papers and ads (you don’t ever use anyways). Make a file pile for important stuff and kids school work, a shred pile, and a receipt pile which usually goes in a bin of it’s own. Clean out old bathroom products. It seems simple and you might just say, oh I have don’t that recently. But have you reaaaaallly cleaned out? I personally used to have a hard time with this one because I hate throwing out products I paid money for when there is still some or all left! I started doing this last year and it reduced my clutter and crap taking over my bathroom immensely, and I didn’t realize how anxious it was really make me while getting ready every day. So, what I started to do was check the throw-out date on all of my bath, body, and beauty products. Yes, most bath and body products will tell you how long to keep until it’s time to throw out! Look for this little dealio on the back of every product and it should tell you how long you can keep it for before it’s considered garbage. I didn’t even realize that it was there before and considering all of the chemicals that most of them have I figured it was probably a smart choice! So if you haven’t already start throwing away old products that you haven’t used in a long while, start now! it sounds so simple, but truth is a lot of us are not drinking enough water every day! They say to drink half of your body weight in ounces of water every single day! Not gonna lie.. that’s a struggle for me most days. But, I can tell you from experience that when I do follow along and keep track, I feel SO much better. It’s amazing what being slightly dehydrated can do to your anxiety let alone your body itself! So, if your reading this right now I encourage you to go chug 8 ounces as quickly as you can! (That’s what I do when I like a little challenge!) 😉 Set a timer for every hour on your phone and instead of disciplining yourself to take drinks throughout the day, every time your time goes off chug 8 ounces! You will be to your goal in no time! I know some of you mamas are amazing at cleaning out your fridge and freezer often but for some of us, that’s like the very last thing on our mind. So, what I do, is every month (every two months realistically) I go through all of the bottles of condiments and everything that’s gotten pushed to the back, and I throw away everything outdated. Surprisingly, a lot of condiments don’t last as long as you think they would! Then, I also throw away anything in the freezer that’s been opened and not used again in awhile. For instance- the garlic chicken frozen dinner from Costco, .. sometimes we don’t make it all at once but there’s a little left that we hang onto in hopes to use again..and then we never end up actually making it. A basket full of socks?? Who Am I kidding? None of us have those in our homes right??? Wrrong! Well, I do anyways.. and it’s like always super full.. and I never have the time or mental energy to match them all. We are a family of 5 now y’all don’t judge me. This whole motherhood thing gets pretty fricken’ tiring if you ask me! And folding socks are the last thing I ever want to do..
and watching TV doesn’t help.. because I would rather just relax and.. watch TV. But, when you take the time to finally get down to it and you do have the mental energy, I encourage you to keep going until the very last sock! What I do is when I can’t find a match and it’s been lonesome for more than a few months, I throw it away..
That basket gets overwhelming for us sometimes and we don’t even realize it.. and yes, it creates irritation for the whole entire family when no one can find a darn pair of socks to wear for the day and they are in a hurry! What I do is I put them in piles according to how big and small they are and then I start with the big socks first because they are always super overwhelming and take up a lot of the sock space I’m workin’ with. Then, there’s always a bunch of kids socks so I group those into dark and light colors.. and then so on and so forth, grouping socks DOES make it easier and quicker to fold and put away! Try it and let me know what you think! Did it help you become more efficient when doing it?? Are you relieved a little now?? Do you think my 5 tips could be helpful for you and managing your everyday anxiety? Don’t forget to share with your friends, and pin it for a later date! (I know we all have those days where we try to accomplish Pinterest goals), let this be one of your goals! all good tips. anxiety is a real struggle with our busy lives and maintaining work/life/parenting balance. these are such amazing tips–thanks for sharing them! i often forget to take time to take care of my anxiety and this was a great reminder!